Despite its prevalence in emerging economies, everyday-life business deviance (EBD) and its antecedents have received surprisingly little research attention. Drawing on strain theory and the business-ethics literature, we develop a socio-psychological explanation for this deviance. 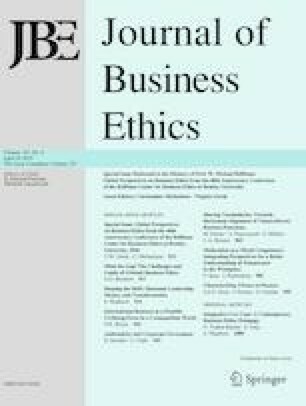 Our analysis of 741 owners of Chinese small- and medium-sized enterprises (SMEs) suggests that materialism and trust in institutional justice affect EBD both directly and indirectly in a relationship mediated by the ethical standards of SME owners. These findings have important implications for researching deviant business behavior within SMEs. This study was supported by the National Natural Science Foundation of China (Grant No. 71402121) and the Research Foundation of Humanities and Social Sciences for Young Scholars by the Ministry of Education of China (Grant No. 15YJC630040). Junzhe Ji declares that he has no conflict of interest. Pavlos Dimitratos declares that he has no conflict of interest. Qingan Huang declares that he has no conflict of interest. Taoyong Su declares that he has no conflict of interest. 2. The things I own say a lot about how well I do in life. 7. My life would be better if I owned certain things I don’t have. 9. It sometimes bothers me quite a bit that I can’t afford to buy all the things I’d like. Bain and Company. (2012). Chinese shoppers world’s top luxury goods spenders, while China luxury market cools to seven percent growth in 2012. http://www.bain.com/about/press/press-releases/bains-china-luxury-market-study-2012.aspx. Retrieved October 30, 2016. China-US Focus. (2016). Private sector economy. http://www.chinabusinessreview.com/private-sector-economy/. Retrieved October 22, 2016. Ipsos. (2013). Global attitudes on materialism, finances and family. http://www.ipsos-na.com/news-polls/pressrelease.aspx?id=6359. Retrieved November 27, 2015. Yan, S. (2015). China has a bigger middle class than America. http://money.cnn.com/2015/10/14/news/economy/china-middle-class-growing/index.html. Retrieved October 22, 2016.